Many of us enjoy taking handwritten notes on a tablet, but everyone hates Comic Sans (those who don't are just wrong). So, how do we take handwritten notes without having to use such vile fonts? 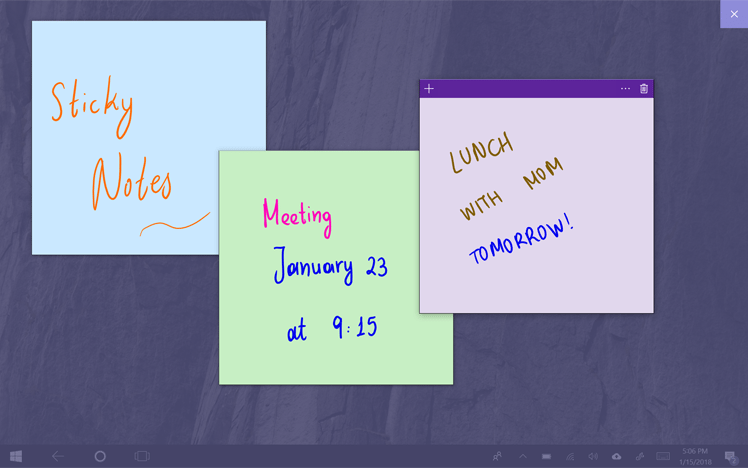 In this article, we will have a look at Microsoft's Windows Ink, which helps us keep notes, draw in every window, and create automatic reminders. So what is it, and how can we use it? 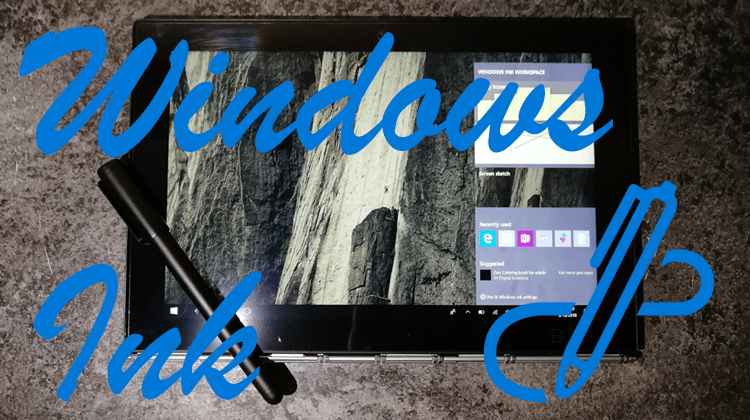 Is Windows Ink worth our time? 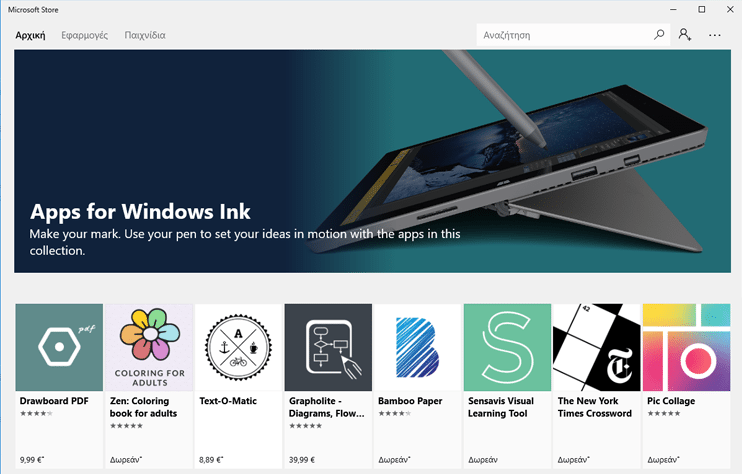 Windows Ink is the name Microsoft gave to their app suite designed for use with a stylus. The operating system had been supporting styluses long before said suite. Although, in Windows 10 Anniversary, Microsoft improved the digital pen experience with apps and features. 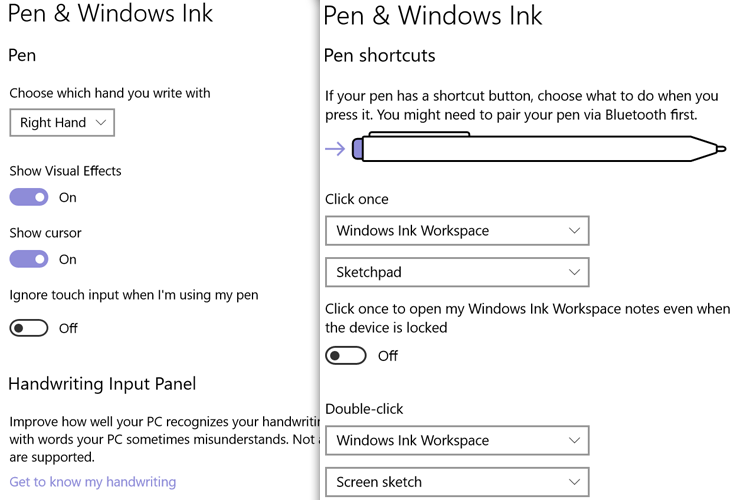 According to Microsoft, Windows Ink focuses on "putting the power of Windows in the tip of our pen." The suite is designed to make writing on our device as easy as it is on a paper. Microsoft integrated a series of apps in the suite, which we are going to go through later on. 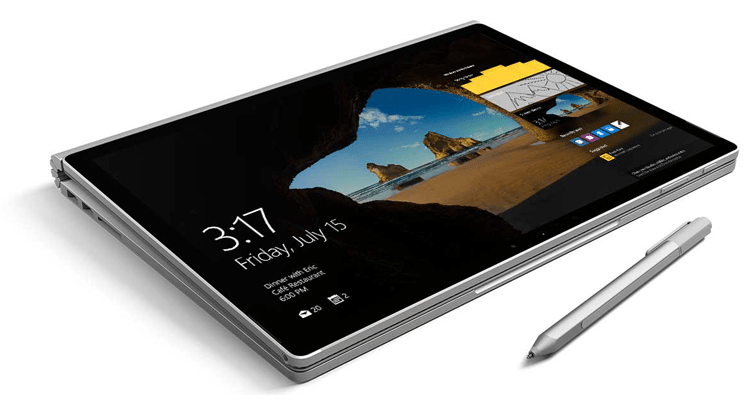 The company has several products that support digital pens, such as Microsoft Edge and Microsoft Office. Compared to typing, digital writing saves time for users who aren't blessed with incredible typing speed, and provides abilities previously unknown to us. For example, we can keep notes on any page on our browser, with the help of Screen Sketch. Using the suite is possible even if we don't have a stylus. However, if we don't use a digital pen, then we may never see the Windows Ink Workspace icon. On the other hand, if we have a device such as a Lenovo Yoga Book[link προς το άρθρο του Yoga], then the suite's icon is automatically enabled. 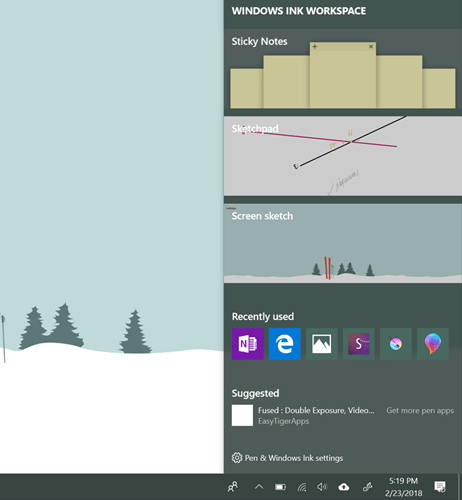 There's no to disable Windows Ink, but we "freeze" the option via its corresponding icon. 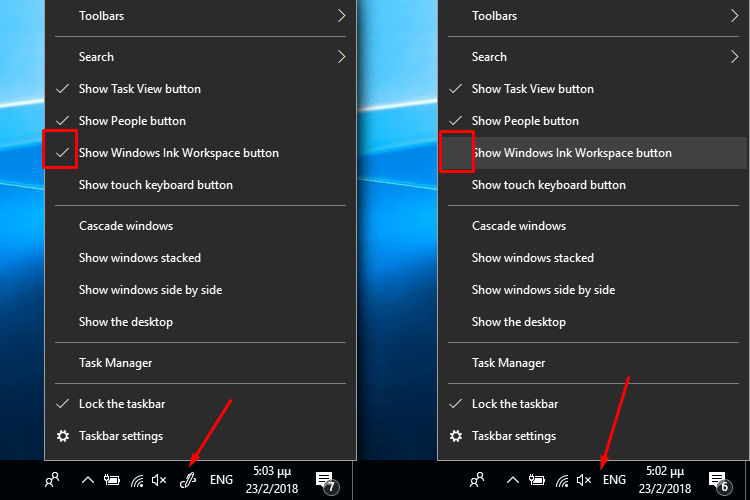 To show the Windows Ink icon, we right-click anywhere in the taskbar, and choose "Show Windows Ink Workspace button." The process of disabling the icon is identical. In that case, there will be no checkmark, and the icon will disappear. The steps described earlier only help us hide the app's icon. 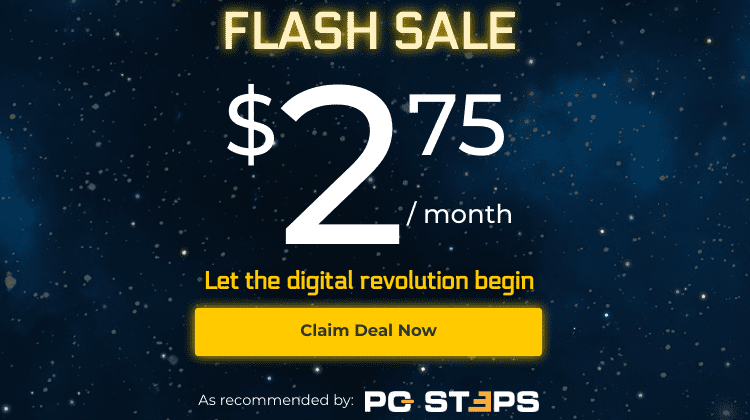 The app doesn't run by default, but if we have the option enabled, then Windows run the service as soon as we boot up our computer. 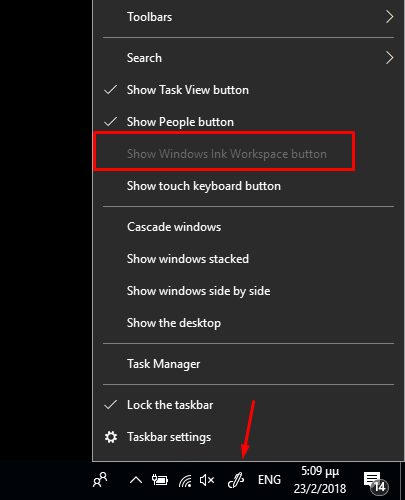 We can save ourselves the trouble of enabling Windows Ink, either by mistake or because someone else enabled the setting. To do so, we need to use the registry. To enter Windows registry, we press Win+R. 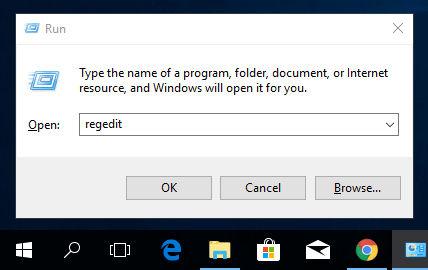 On the window that pops up, we type "regedit," and press Enter. 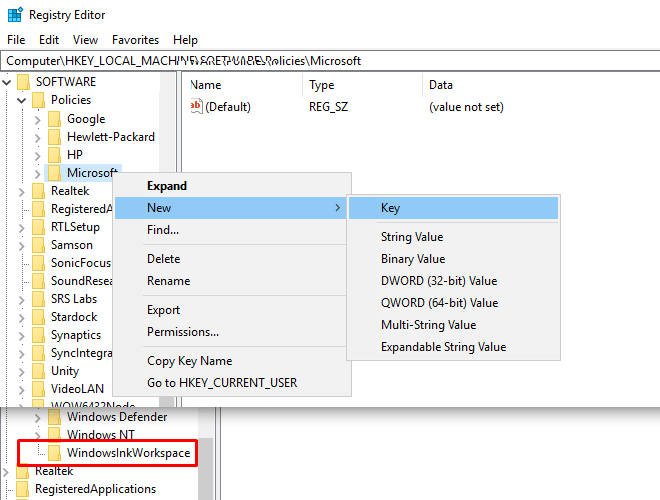 If there is no "WindowsInkWorkspace" key, then we right click on the Microsoft folder, choose "Create," and "Key." We give the new key the name "WindowsInkWorkspace," and click on it. On the blank space to the right, we choose "Create → Value DWORD (32 bit)," name it “AllowWindowsInkWorkspace,” and set the value to 0. We now have to restart our computer. After that, the icon will be missing, and the "show" option will be inaccessible. If we want to enable the setting again, then we follow the same steps and change the value from 0 to 1. 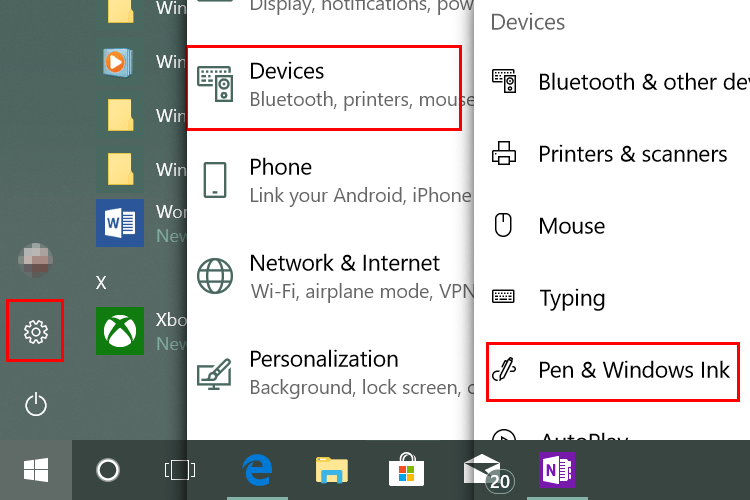 Windows offers personalization for our pen through settings. To personalize our stylus, we go to " Settings → Devices → Pen & Windows Ink." There, we will find various settings for pens, such as choosing whether we are left or right handed, want special effects, and much more. The settings apply to any app we will be using our stylus for. Apart from the apps Microsoft incorporated into the suite, we can find more of them via the Microsoft Store. 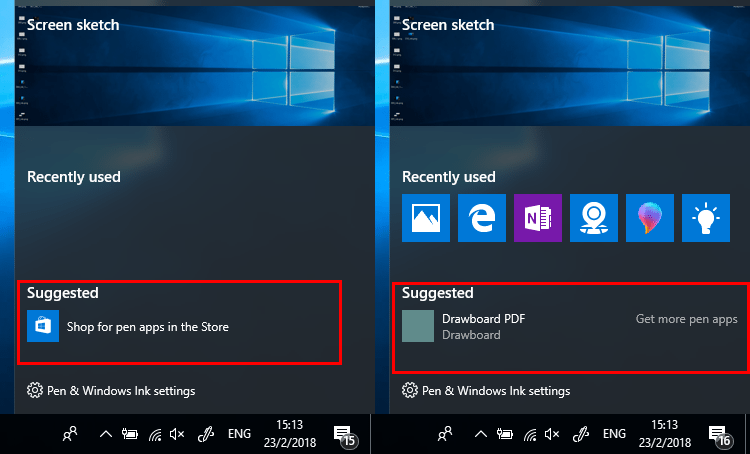 By pressing the Windows Ink Workspace icon, we will be presented with suggested apps, as well as the links "Shop for pen apps in the Store" or "Get more pen apps." When pressing either of the choices, we will be transferred to the Microsoft Store, and any apps incompatible with a pen will be filtered off. There, we can find various apps mainly aimed at graphic designers, or even students. 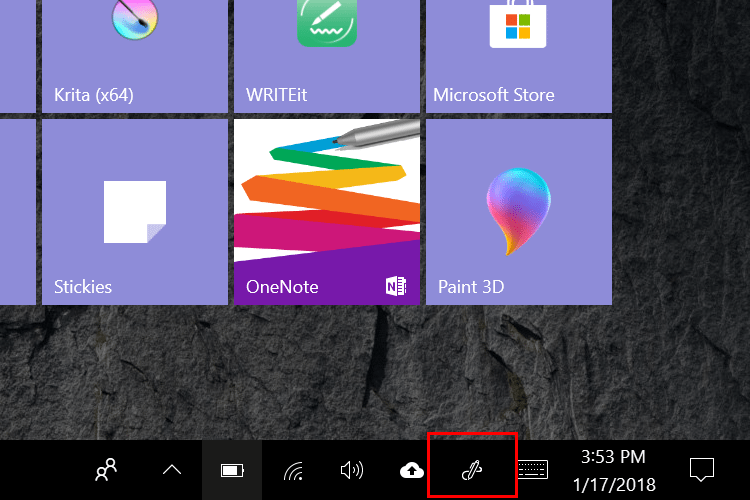 To gain access to pen apps, we click on the Windows Ink Workspace icon. A window will pop up. We will be presented with the three main apps Microsoft has incorporated. It's worth noting that we don't necessarily need to own a pen, since most of the apps can function just as well with a mouse. The first app is called "Sticky Notes." Those of us who were unlucky enough to have used Windows Vista might find the gadgets on the desktop to be familiar. One of them was sticky notes, and Microsoft brought it back from the grave. The notes are now improved, with new features. Cortana is also integrated. When we launch the app, a sticker shows up, and we can write whatever we want on it. Cortana will automatically color blue any critical information such as time and date, addresses, flight numbers, etc. Moreover, if we note a date, for instance, then Cortana will automatically create a reminder with the relevant information. Next up is Sketchpad. It's essentially the digital version of a sketchbook we all used to have when we were kids, but one can also view it as a simpler version of Windows Paint. The purpose of this app is to help us sketch anything we like within seconds. 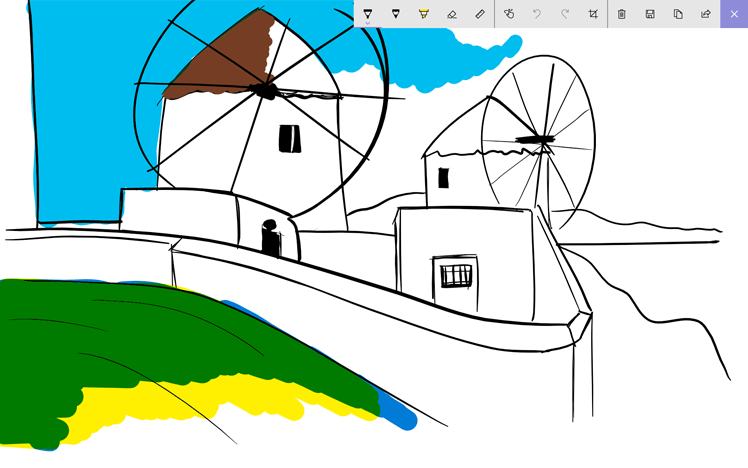 Sketchpad is very simple and has very basic tools. Specifically, we will find a pen and a pencil with 30 colors, a highlighter with 6, and an eraser. 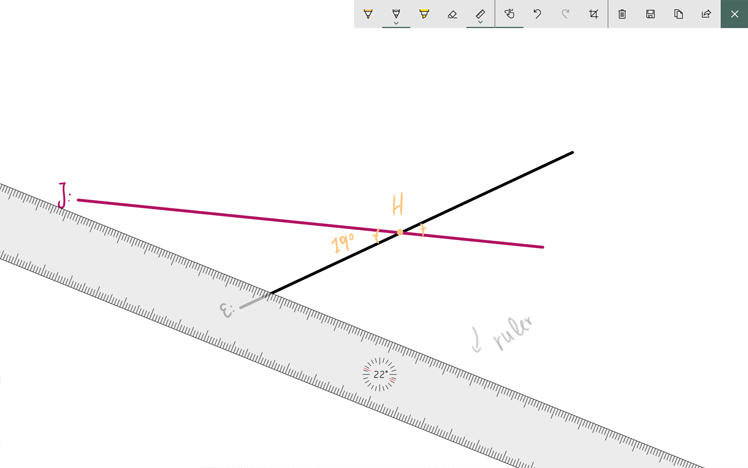 The most exciting feature is the ruler, which allows us to draw straight lines as we would do on paper. As beautiful as its simplicity might be, it also comes with a couple of drawbacks. It only allows us to save our file as a PNG, and we can't open other saved images in it. The last app from Microsoft is Screen Sketch. By opening it, the app instantly takes a screenshot of what is currently on our screen. We can write anything on it using the same tools as we would in Sketchpad. Lastly, we can save and share our notes. 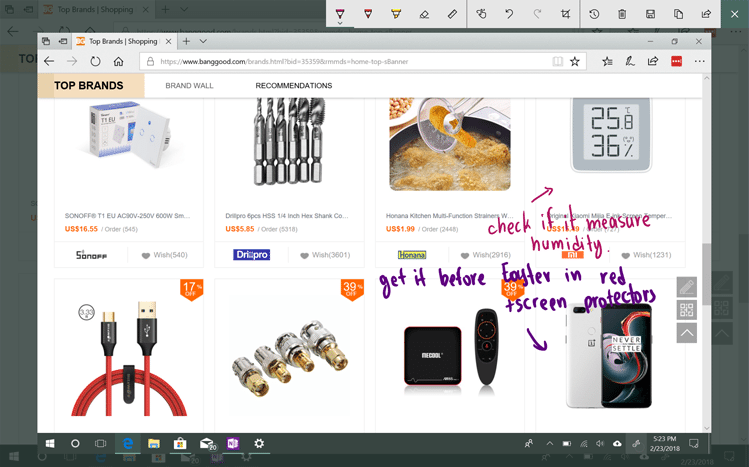 We can use Screen Sketch on Microsoft edge, too. To enable the app, we press the pen icon on the top right. The tools are identical to those of Sketchpad. Did you know what Windows Ink is? Do you have it enabled? Are you going to give it a try, or does it seem like more hustle than it's worth? 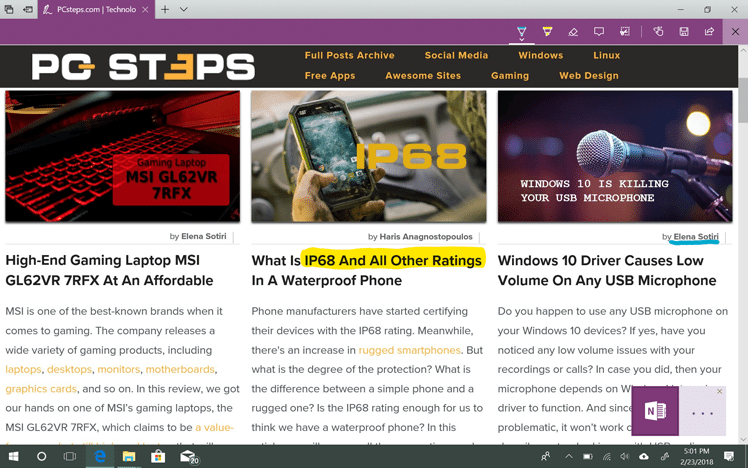 Would you like to see more articles like that? We'd love to hear your opinion in the comments.